A photo of a 6-year-old Atlanta gymnast who counts Simone Biles and Gabby Douglas as her heroes caught the eye of Biles, who shared the photo with her own fans. Biles, 19, who won five medals at the Rio Olympics, retweeted a photo montage of Nyla Miller dressed in a red, white and blue leotard holding a trophy and flowers. The photos of the now-first grader were taken when Nyla was 3, one year after she started taking gymnastics lessons. Miller, who lives in South Carolina, said he was Face Timing with his daughter last weekend as she was watching Biles and Douglas compete in Rio. Nyla’s mother, Jessica Williams, said her daughter first fell in love with Douglas when she competed in the 2012 London Olympics. This year, Nyla was overwhelmingly excited to see Simone on the team. Williams said Nyla –- whose first question was whether the gold medals on Biles' and Douglas’ necks were real or chocolate –- also began to ask questions about whether she could ever do what she watched her heroes achieve at the Olympics. 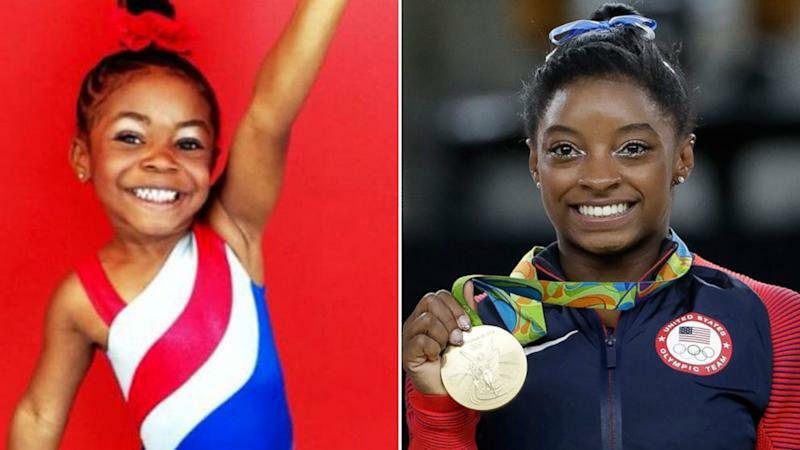 Williams said Nyla, who wrote in a school project that she wants to be a "jiminis" [gymnast] when she grows up, got “jittery” when it was explained to her that Biles had seen her photo and shared it. Miller said he was surprised that his tweet was shared by Biles, and nearly 14,000 other people.